Russian President Vladimir Putin has approved an order to withdraw the nation from the process of joining the International Criminal Court (ICC). Russia signed the Rome statute, which governs the ICC, in 2000 but never ratified the agreement to become a member. The decision came after an ICC ruling that Russia's activity in Crimea amounted to an "ongoing occupation". Russia thus joins the US and other nations which have rejected the court. The court ruled Russia's 2014 takeover of the Crimea peninsula had been an armed conflict between it and Ukraine. This would mean the annexation fell under the court's jurisdiction. But Kremlin spokesman Dmitry Peskov said the wording "contradicts reality", while the foreign ministry called the court "one-sided and inefficient". Russia has found itself the subject of the court's focus on more than one occasion. Earlier this year, the ICC authorised an investigation into the 2008 Russia-Georgia conflict in South Ossetia. In response to Russia's withdrawal, the court's chief prosecutor said: "We owe it to future generations not to abandon the ICC." The ICC was established to pass judgement on four international crimes: genocide, crimes against humanity, war crimes and crimes of aggression. The US initially signed the Rome statute under the Clinton administration but later withdrew, under the leadership of George W Bush. Sudan and Israel have also withdrawn their signatures in the past, while other nations - including China and India - have rejected membership outright. Earlier this year, South Africa, Burundi and The Gambia all decided to withdraw completely. Several other African nations have also expressed doubt over the court's future, amid allegations that it is too focused on countries within the continent. In the court's 14-year history it has only brought charges against Africans. Russia is neither a member of the ICC nor a donor country. There is a sense here that this was a symbolic announcement, designed to undermine the legitimacy of the court at a time of unprecedented uncertainty following the withdrawal of three African nations. And there are rumours more could follow - Kenya, Namibia and Uganda have indicated they are considering joining the exodus. There has been a concerted effort to reassure countries that their concerns regarding the ICC's perceived bias towards African nations have been heard. But it may be too little, too late. The ICC chief prosecutor, Fatou Bensouda, described recent withdrawals as "a set-back" and "a regression from what we all want to achieve - justice for atrocity crimes". She told the BBC that African states were now speaking out in support of the court and "renewing their commitment". 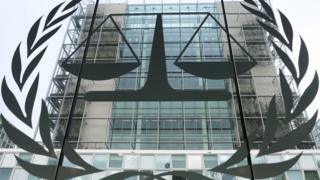 Is this the end for the International Criminal Court?